Managing your Money by "The Book"
Meet at the Lowe's Parking Lot at 9 a.m.
"Minor League Baseball Has Come to Lexington"
Wayne Jennings, an association professor of Parks and Recreation at Eastern Kentucky University and former president of the Richmond Kiwanis, provided entertainment for the banquet. Beth Sullivan, newly installed president of the Richmond Kiwanis encourages Wayne during his performance. 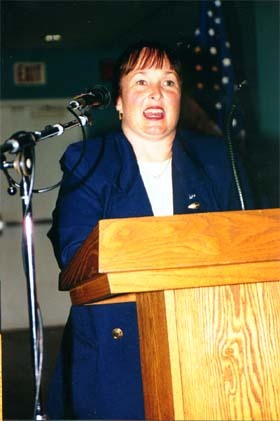 Piddle Johnson, as the Keynote speaker at the 2000 Annual Installation and Awards Banquet, she focused on the many charitable activities of the Richmond Kiwanis; a total giving program of $20,000 for the past year. Brenda Blankenship (left) and Dr. Robert Nayle (not in attendance) were honored for their leadership of the 1999 Golf Scramble. Beth Sullivan, is congratulated by club president David Benge, for organizing the programs during 1999. Beth, who took over as president of the Richmond Kiwanis, was given some lighthearted ribbing about her pumpkin and basket projects. Honored for their contributions to the Girls State Basketball Tournament Program Sales fund raiser were (from left to right) Mark Calitri, Kiwanis President David Benge (who made the awards), Patrick McMahon and Tracy Burdette. Some of the above were unable to attend the banquet and received their awards at the next club meeting. Click here to see those photographs. The annual banquet was an excellent opportunity for members and their spouses to meet each other. Earl Rhodes pondered the meaning of it all. A unique remembrance of the evening was distributed by incoming president Beth Sullivan. A favor made in the Kiwanis colors of Blue and Gold. A rock wrapped in a blue cloth representing the basic rock-like beliefs of Kiwanis, and several quotes and facts pointing out the many values of Kiwanis. Dr. Ken Clawson (left) who conducted the induction ceremony is shown with new member Matthew Webb the Headmaster at the Richmond Christian Academy. Brooke Elliott (left), a local writer and expert on hunting and fishing, visits with Kiwanian Dave Harkleroad after a presentation to the club. Bo Shafer becomes President of Kiwanis International on October 1. The Richmond Kiwanis Club extends congratulations to Shafer on his assuming leadership of the Kiwanis International! University of Tennessee Circle K club. An independent insurance agent, Shafer also is a board member at First Tennessee Bank. 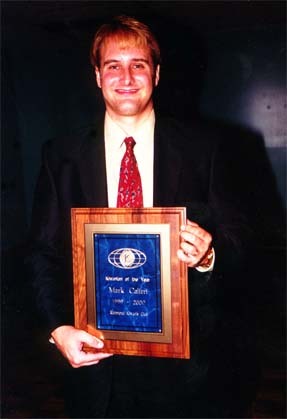 He is a former vice-president of the Knoxville Chamber of Commerce and past president of the Knoxville Executives Club. An elder and Sunday school teacher (for more than 30 years) at the Second Presbyterian Church, he is a Bible study leader for a group of business and civic leaders. Shafer's civic involvement outside of Kiwanis has included service for the Salvation Army Board (for more than 30 years), the United Way, Ronald McDonald House, Children's Hospital, and Big Brothers/Big Sisters, which he co-founded in Knoxville. He also has been active with the Knoxville Harvest food bank and a Boy Scout troop in a low-income housing project. The (US) National Society of Fund Raising Executives recently gave Shafer its Outstanding Civic Leader Award. Shafer in addressing Kiwanians said, "You are the luckiest people on Earth, because you are in the enviable position of having the wherewithal to serve those in need. ""We are blessed big-time," Bo says. "We are on the giving side of charity, not the receiving side, and we didn't do anything to deserve it." A 38-year member and past president of the Knoxville club, Bo sees Kiwanis service not as a duty but rather as a privilege. He believes passionately in Kiwanis' capability to make life better for the world's needy, and he wants to spread that message among the Kiwanis family. Source of the above information - and additional information on the latest convention in Miami Beach may be found at the Convention Daily Web Site and also in Kiwanis Magazine. 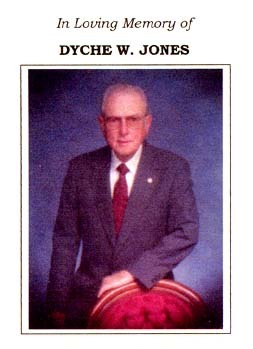 Dyche W. Jones, 85, a member of the Richmond Kiwanis Club for the last five years died Saturday August 12th.. Following a private burial in the A.R. Dyche Memorial Cemetery, a Celebration of Life and Faith was held at the London First Baptist Church on Tuesday at 11 a.m. In addition to managing a thriving grocery business in London which grew into several grocery stores in southeastern Kentucky, Dyche found time to serve for many years as Music Director for the First Baptist Church of London. He was an active community leader serving on the very successful Laurel County Development Association and as the first Chairman of the Laurel County Industrial Authority. Before moving to Richmond, in order to be near his son , he had been a member of the London, Kentucky Kiwanis Club for 53 years He served as President of the London Kiwanis Club, Lt. Governor of Division 8, and Governor of the Kentucky-Tennessee District of Kiwanis. Dyche W. Jones was the epitome of what Kiwanis is all about. We shall miss him. Since moving to Richmond, Dyche attended First United Methodist Church where he became a good friend of Kiwanian and good Samaritan Larry Bernhard. Larry assumed a role as his driver and helper in his declining years. Larry deserves much credit for assisting Dyche in many ways and for bringing him to Kiwanis meetings. Hugh Downs, one of the most familiar faces in the history of American television, is trading the anchor desk for a computer terminal. Friday, Sept. 24, he stepped down after 21 years as host and reporter for the award-winning newsmagazine to begin a new career as an Internet enthusiast. Friday, Sept. 24 featured his final news report for ABC NEWS, a candid interview with Barbara Walters and a poignant tribute to his record-setting, six-decade career in broadcasting, Friday, Sept. 24 (10-11 p.m., ET). After 37 years of working together, Walters sits down to interview her longtime co-host and friend. On the other side of the microphone, Downs has an opportunity to share his personal stories and candidly express some of his more controversial views, including his opinion on the legalization of marijuana. Downs has rarely talked about his views on television. For his 20/20 finale, Downs traveled to Indonesia in cooperation with UNICEF to report on an epidemic problem: Iodine Deficiency Disorder, an illness caused by the lack of iodized salt. An estimated 40 million Indonesians suffer from the disease, which can cause mental retardation, cretinism and severe goiter. In Indonesia ó and 100 other countries worldwide ó a large-scale effort is underway to educate the population and restore this vital element to their diet. The technology for fortifying table salt with iodine is simple and inexpensive, and as Downs learns, the best way to protect the billion and a half people at risk for this often hidden problem. UNICEF and other organizations, including the International Council for Control of IDD, the World Health Organization and Kiwanis International are giving money and expertise to countries struggling with the disease. Howard Loveland, Director of the Telford YMCA, told Kiwanians about the development and future plans of the YMCA. He indicated that the last major expansion of the YMCA was completed in 1994, but that there are a few smaller projects still being planned. He observed that one of the major growth areas for the YMCA was in senior citizen programs. These include aerobic swimming and total body recall. He indicated his appreciation for continuing support from the Richmond Kiwanis and also expressed his appreciation for the work of local Kiwanian Bob Nayle who serves on the board of the YMCA. Loveland told the Kiwanian's that "day care" was the first program undertaken by what would eventually become the YMCA. He said the most significant day in the history of the local YMCA was in 1986 when affiliation with the national YMCA was approved. Expansion of the YMCA programs was spurred on when the Junior Pro Basketball League used their facilities in the early years. This brought youth from across the city to the facility. "By Spring of 2000 there were 3,600 members of the Telford YMCA," Loveland said. Loveland added that one of the long range plans was the development of a Pain Management facility. He said Dr. Ney and Dan Lichty are seeking grant funds for a hydrotherapy facility. Mac Kilduff, deputy press secretary to both President John F. Kennedy and Lyndon Johnson spoke to the richmond Kiwanis Club on September 26. He recounted many of his experiences with the Eisenhower, Kennedy and Johnson administrations. His speech included details about the Cuban missle crisis and the assasination of Kennedy. He recalled his experiences in the press car (the third car in the Dallas motorcade (see photo below). He indicated that his experience supports the lone gunman theory. He indicated that he thought Oswald wanted to kill Texas Governor John Connley because he had previously signed Oswald's dishonorable discharge from the Marines whihc Connley was Secretary of the Navy. Kilduff is a long time member of the Beattyville, KY Kiwanis and former Lieutenant Governor of Kiwanis.